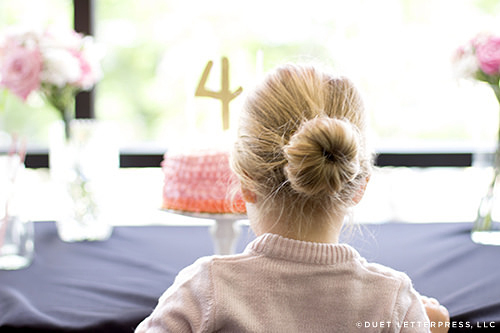 A while back, we shared with you Em’s fourth birthday invitations. 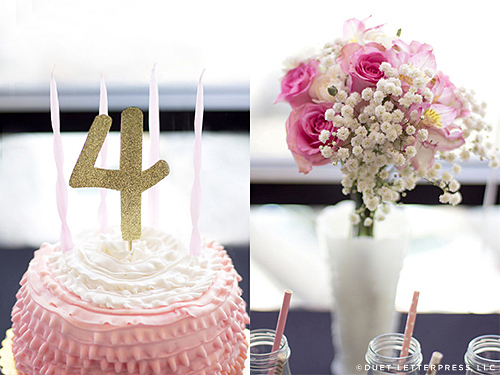 Today, we’ll share her party pics with you! Em takes dancing. She loves it and has made a few friends in dance class. And, it just so happens that many of her school friends also take dance classes. 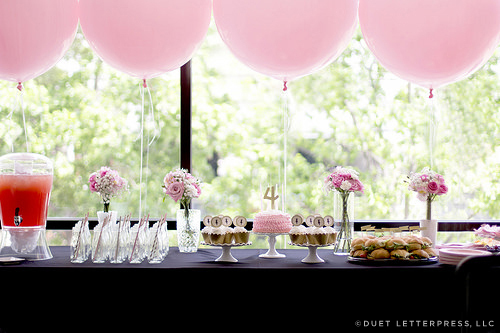 So, we decided to throw a ballet birthday party for Em! Her ballet birthday was held at Ballet Austin. The set up was wonderful! In one, window-filled room there was food + cake. 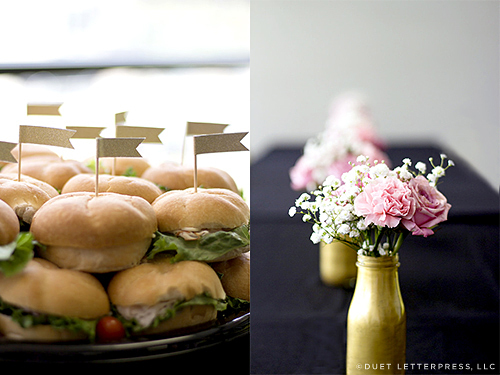 Sandwiches, cupcakes and a small cake all came from a local grocery store. The flowers did too. I bought several types of flowers and arranged them the day before the party. For the table decor, I painted some of the drink bottles we already had on hand. We placed a few small floral arrangements in them. 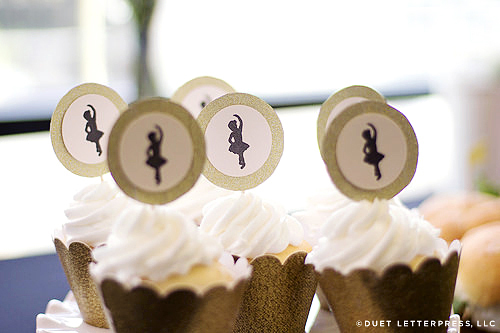 The vintage cupcake toppers we ordered never arrived. So, we improvised. We made these toppers using scraps from her invitations and glitter paper. 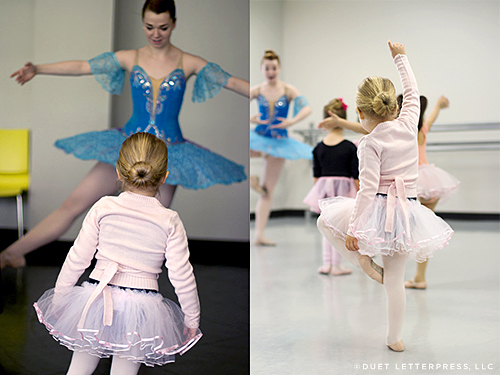 A real ballerina in a beautiful tutu brought the girls into a dance studio for a forty-five minute dance class. After the class, the girls returned for refreshments and cake! 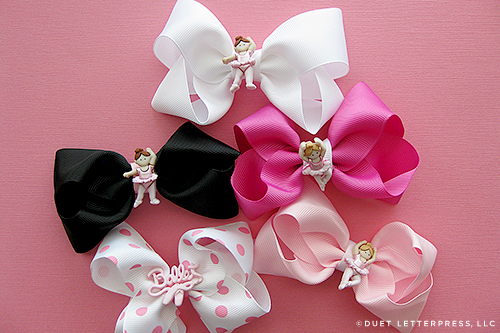 For the favors, we embellished hair bows with ballet buttons. Each girl received a bow and a bracelet inside a pretty gold polka dot bag. So that’s it! 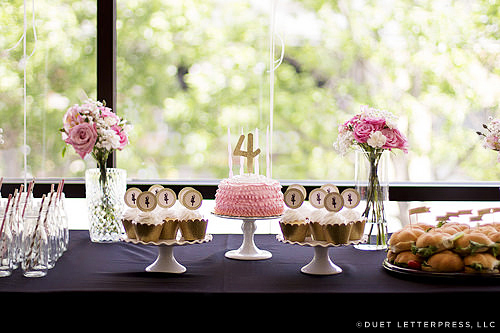 Em’s ballet birthday party to celebrate turning four. A big thank you to all that were able to join us. This entry was posted on Tuesday, September 9th, 2014 at 10:34 am	and is filed under parties. You can follow any responses to this entry through the RSS 2.0 feed. You can leave a response, or trackback from your own site.